In the rush to meet the target of 1.75 lakh MW of renewable energy capacity by 2020, the Centre and several states have issued tenders totalling 30,549 MW. 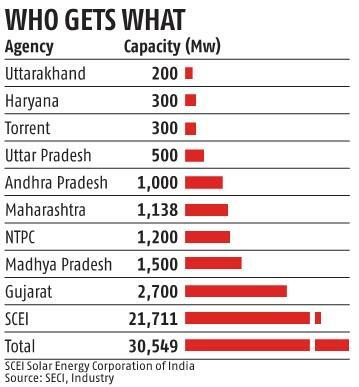 Of this, only 4,000 MW are wind power projects, 1,800 MW are hybrid (solar+wind) and balance 24,749 MW are solar power projects. The bids for these projects are due in next three months. If concluded on time, these projects should be commissioned by March 2020. The earlier deadline for 1.75 lakh MW was 2022, but the government later said it would meet the target by 2020 and achieve more than 2 lakh MW by 2022. Solar Energy Corporation of India (SECI), the nodal agency of ministry of new & renewable energy (MNRE) has issued 19 tender notices. This includes the mega 7,500 MW solar project in Ladakh region, 3,000 MW solar manufacturing and power plant, which failed last year and one floating solar project in Jharkhand. Of the tenders issued, Andhra Pradesh has already received expression of interest for its 600 MW hybrid power project from close to a dozen companies. Greenko, Adani, Suzlon, Gamesa, ReNew Power, Hero Future Energies, Sembcorp are some of the companies which have shown initial interest in the pre-bid meeting held last month. 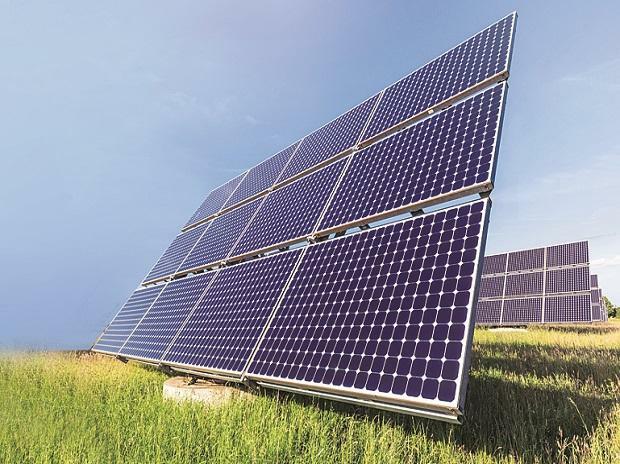 The bid submission date for the 3,000 MW solar manufacturing linked power project was March 18, 2019, which has now been extended to April 4. This tender was closed unsuccessfully last year after six extensions. Only one joint bid came from Azure Power & Waaree Energies which was cancelled later. While the government is buoyant with this mass scale project announcement, the industry is sceptical as past projects face problems. Imposition of 5 per cent GST on solar project and safeguard duty on imported solar panels has escalated the cost. The record low bid of Rs 2.44 per unit in solar and Rs 2.48 per unit in wind has not repeated for two years now. The tariff in both is currently prevailing around Rs 2.65-2.8 per unit. “Developer sentiment has been negatively impacted by the lack of clarity on several policy issues and arbitrary bid cancellations, which is contrary to a supportive policy stance from the government,” rating agency CRISIL said in its latest report. In August last year, MNRE cancelled a bid by SoftBank Energy alleging cartelization and citing bid amount of Rs 2.77/unit to be too high. Due to lack of interest and rising tariff because of high cost, several projects were also cancelled. CRISIL estimates close to 4,700 MW of projects were cancelled over March - December 2018. “GST clarity was lacking for over a year and it ended with an increase in taxation compared to what was expected by the industry. Similarly, the safeguard duty has turned out to be a double whammy of sorts, impacting costs of solar power projects and not resulting in any significant offtake for the domestic manufacturing sector. This was coupled by cancellation of bids post auctions as state utilities / SECI found tariffs to be higher than expectations,” CRISIL said in its report. After a year of announcing GST rate of solar, the Centre in December 2018 clarified that 70 per cent of the gross value of project shall be deemed to attract 5 per cent rate. While solar panels were classified under 5 per cent tax slab, industry had contested saying other equipment such as metals, electrical material etc are under different and higher tax slabs which would increase the cost of power project. As the cost increases, financing has become a tough task for the project developer. A minimum capital investment of Rs 1,000 crore is needed in the current bidding regime. The government has capped minimum bid value at 50 MW which is Rs 200 crore. Renewable is facing a double whammy with both banks and PE/VC funds drying up and falling tariffs making project funding a difficult task. Then there are close to 50 GW of renewable energy projects – 40GW wind and 10 GW solar that require refinancing. In wind power, the situation is more precarious. The BJP government introduced competitive bidding in the sector in 2016, retiring two decade old system of awarding projects through regulator approved tariff. Since then, the growth in wind has remained subdued, with leading companies going in red, as orders dry up. In the current fiscal, 1,145 MW of wind capacity has been added, as compared to 3,994 MW in solar, till December 2018. India’s current renewable power capacity stands at 75,760 MW which includes 35,288 MW of wind power and 24,582 MW of solar.